Horror movie by Noriaki Yuasa from 1971. Space aliens arrive on Earth with their giant shark and intend to take over the planet but they must first destroy Gamera. 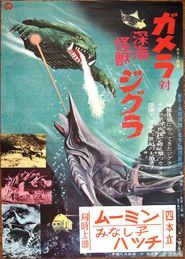 Gamera vs. Zigra (Gamera tai Shinkai Kaijū Jigura) is a 1971 Japanese kaiju film directed by Noriaki Yuasa. It is the seventh film in the Gamera film series.